Bob Lanier always knew how to attract a crowd. Who else could get such disparate political personalities as Sheila Jackson Lee and Tom DeLay in the same room, along with the current Houston mayor, two former mayors and just about every aspiring politician in town? In the packed chapel at Geo. H. Lewis & Sons funeral home, River Oaks socialites and wealthy financiers mingled with Third Ward activists and entry level office workers while former news muckraker Wayne Dolcefino jawboned Greater Houston Partnership chair Paul Hobby and his wife Janet, who stood along a wall in the back of the room because there was no place to sit. And, to cap it off, mega-celebrity preacher Joel Osteen officiated over it all. "He rose from obscurity to a man who touched us all. Standing 6-foot-4, full of Texas charm and a brilliant mind, he was destined from the very beginning to stand out." "Mayor Bob" got a heck of a sendoff Tuesday morning during a poignant 80-minute service — and, as a fierce champion of Houston's diversity, he would have loved the sight of Houston's rainbow coalition coming to say goodbye. Lanier, who served as Houston's mayor from 1992 to 1998 died unexpectedly at his River Oaks apartment Saturday afternoon of natural causes, just hours after his weekly luncheon with family members at the River Oaks Country Club. He was 89. "You all know Mayor Lanier was a remarkable man," Osteen told the audience, recalling that he first met Lanier at his father's church, which Lanier occasionally attended. "He rose from obscurity to a man who touched us all. Standing 6-foot-4, full of Texas charm and a brilliant mind, he was destined from the very beginning to stand out. He left an incredible mark on our city." Yet, the service really didn't dwell much on Lanier's political accomplishments, but rather focused on his personal impact on friends and loved ones — in Osteen's words, "It's a time to celebrate a life well-lived." Lanier's longtime friends Vincent Kickerillo and Charles Hurwitz, who were among several men of Lanier's generation who gave eulogies, choked back tears as they spoke, as did Lanier's fresh-faced grandson Robert Clayton Lanier III, a high school junior, who stopped several times to regain his composure while speaking. "He made diversity the best asset the city could have," Pitcock said. "As you know, he certainly had the gift of gab," Lanier III said lovingly of his grandfather. "He had a way of making you think you were the most important person in the world." As the only female to speak, Lanier's fiesty young granddaughter Louisa Lanier Sarofim recalled how her grandmother, Elyse Lanier, threw all of his suits away and gave him a "complete makeover." She also recognized his accomplishments in fighting for equal rights and his generosity. Highway construction magnate and philanthropist Doug Pitcock recalled how he and Lanier traded stories about who was the poorest growing up. "I quit when he talked about having to walk to the outhouse in the mud and cold rain," Pitcock said. Pitcock noted how Lanier had served in the Navy and graduated from law school by the age of 22. "He was one of the smartest men I have known in my life," Pitcock said. He also recalled how Lanier considered a city streets project to get sidewalks in Houston's poorer neighborhoods one of his greatest accomplishments. "He made diversity the best asset the city could have," Pitcock said. 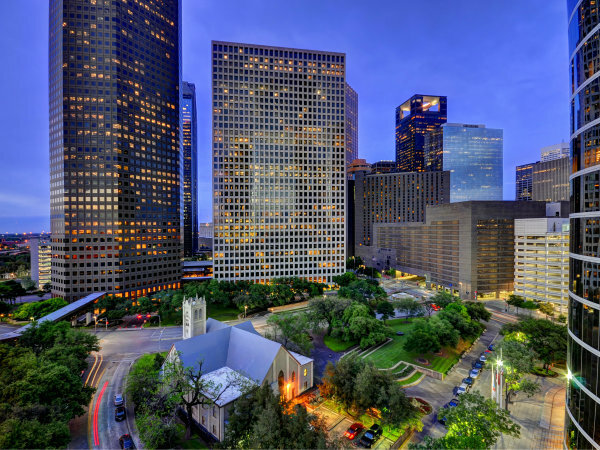 Indeed, the audience who came to pay their final respects reflected the diversity of 21st century Houston, as black and brown faces made up more than half of those in attendance. "Yours was one of the rare lives that made a difference in Houston, Harris Counry and the rest of Texas," attorney Ken Friedman noted in his eulogy. As the service neared conclusion, Osteen said Lanier's life should inspire us to be our best. "Let us continue to honor his legacy by making the world a better place like he made it." Before the service began, Elyse Lanier and daughter, Courtney Lanier Sarofim, greeted guests who formed a long line to pay their respects. As waiters in white coats served refreshments while a string a string quartet played, the atmosphere took on a festive tone as many who served Lanier while he was in office reminisced about the good times with Mayor Bob. "It's like a reunion," one observer said. After the service, the family gathered for a private burial at Memorial Oaks Cemetery.